There's an exhaustive changelog on the Action Launcher website, so here it is. The Pie revamp isn't particularly obvious on the home screen itself. However, open up the settings and you'll see some immediate differences (see top). The UI is lighter, and the icons next to each menu item are circular. You can also search the settings now. 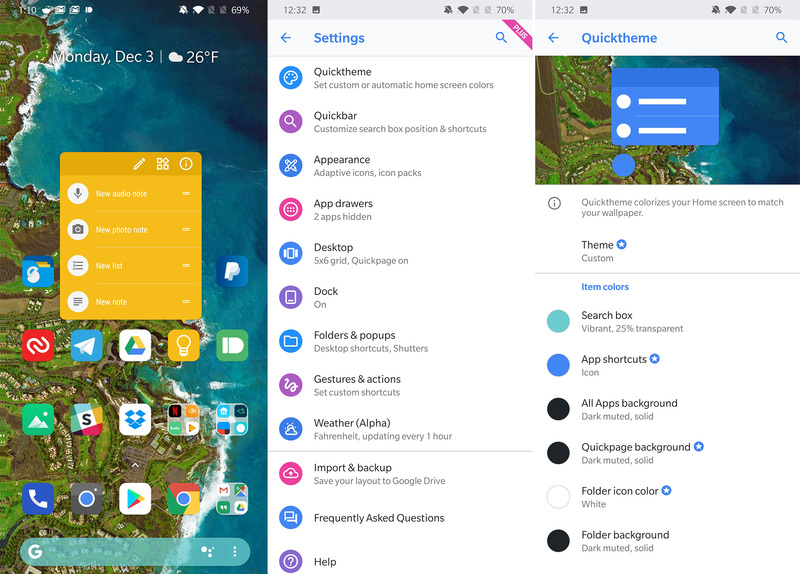 If you like fiddling with Action Launcher's excellent Quicktheme engine, you'll be happy to know v38 adds more granularity to the color settings. This version is still a beta, so there may be some rough edges. Adventurous types can grab the latest build from APK Mirror. Otherwise, you can wait for the final build. • Revamp the app's overall look & feel, embracing Pie's color and styling. • Overhauled app settings (including addition of settings search). • Added the 2018 Supporter Badge, including five bonus wallpapers! • Proper infinite scrolling for Dock and Home screens. • More fine-grained Quicktheme controls. • Restore the "Lock device" shortcut trigger. • Use Pixel Launcher styling for All Apps search bar. You can download it from the Play Store below, or you can grab it from APKMirror. If you need it, version 2.0 of the Google Feed plugin is also available on APKMirror.